By now it’s pretty clear that Vancouver can’t get enough of Dwayne ‘The Rock’ Johnson. So much so that Vancouver Mayor Gregor Robertson officially announced a day dedicated to the movie star. Turns out The Rock Day has already passed – since it took place on October 19. However, Roberston tweeted about the announcement today. Roberston even took some time to visit Johnson, who is currently in town filming his new blockbuster action flick, Skyscraper. 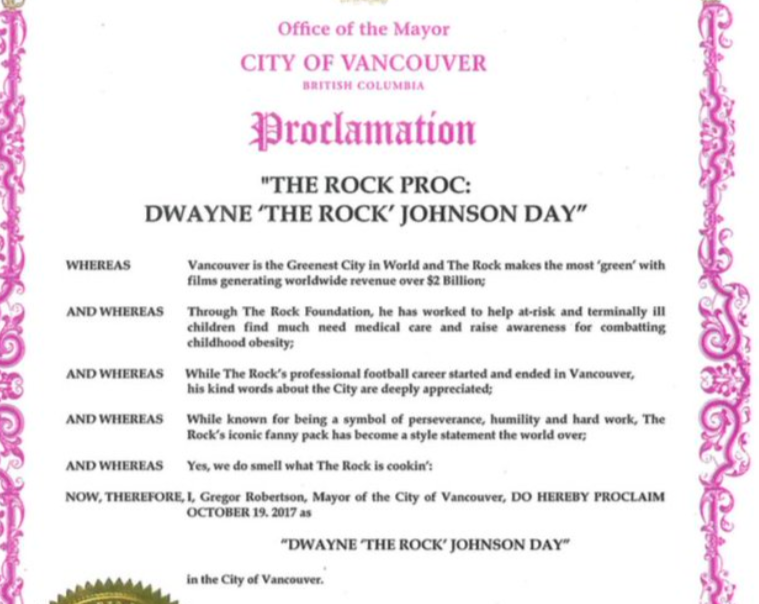 The Mayor also presented him with an official proclamation (fittingly titled ‘The Rock Proc”) declaring that October 19 will officially be known as Dwayne ‘The Rock’ Johnson Day. The proclamation recognizes Johnson for his foundation and working to help at-risk and terminally ill kids. It also takes note of how Johnson’s professional football career ended and started in Vancouver — something that the star talks about often. 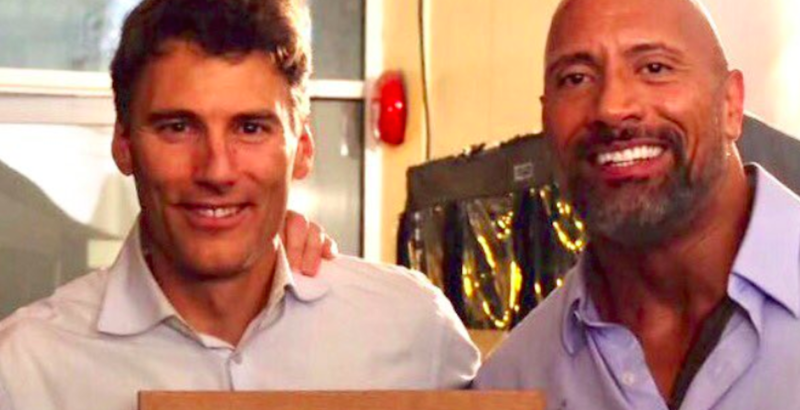 Of course, The Rock took to Instagram to thank Mayor Robertson and the City of Vancouver for welcoming him. “Thank you Mayor and your staff for being so gracious and welcoming to myself and our entire production crew to your city. And thank you for this honor and thanks for being such a cool guy. Vancouver will always hold a special place in my DNA,” he wrote. We’ve got to say that our feelings for The Rock are mutual. Earlier this week, Johnson also thanked Mayor Linda Hepner, as her office worked closely with the production team for the movie’s scenes filmed in Surrey. Skyscraper‘s filming in Vancouver is scheduled to conclude on November 17.